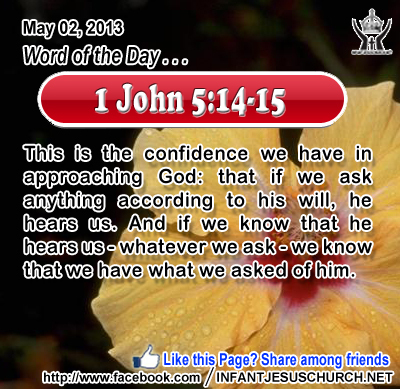 1 John 5:14-15: This is the confidence we have in approaching God: that if we ask anything according to his will, he hears us. And if we know that he hears us - whatever we ask - we know that we have what we asked of him. Heavenly Father, for the grace of your listening ear we thank you more than words can say. Through the authority of Jesus our brother and by the grace of your interceding Holy Spirit, we offer you our thanks and love this day. Amen. 9As the Father has loved me, so have I loved you; abide in my love. 10 If you keep my commandments, you will abide in my love, just as I have kept my Father's commandments and abide in his love. 11 These things I have spoken to you, that my joy may be in you, and that your joy may be full. Jesus gives his disciples a new commandment - a new way of love that goes beyond giving only what is necessary or what we think others might deserve. It is love to the death - a purifying love that overcomes selfishness, fear, and arrogance. It is a total giving of oneself for the sake of others - a selfless and self-giving love that is oriented towards putting the welfare of others ahead of me. Through the shedding of his blood for our sake, our sins are not only washed clean, but new life is poured out for us through the gift of the Holy Spirit. We prove our love for God and for one more when we embrace the way of the cross. What is the cross in our life? When our will crosses with God's will, then God's will must be done. Loving Infant Jesus, may we always grow in the joy and hope which your promises give us. Inflame our heart with love for you and your ways and with charity and compassion for our neighbor. May there be nothing in our life which keeps me from your love.